"O how unspeakable is this Sacrament which sets our affections ablaze with charity. It is the fulfillment of Christ's Mystical Body." need to hear these words. Love unceasingly present among men. "I am making my retreat with the Eucharistic Heart. I am on fire, burning with the desire to love God and to bring others to love him. 'Our Lady of the Eucharistic Heart, I beg you to give Jesus to souls!'" "My greatest happiness is to be before the Blessed Sacrament, where my heart is, as it were, in Its center." "The Eucharistic Heart in the Host draws me more and more. If I merely pass near the chapel, I feel an irresistible force inviting me in. Close to the tabernacle, I experience an indefinable joy. When the Blessed Sacrament is exposed, I feel totally taken over, paralyzed, by this gentle Eucharistic Heart. When I leave the chapel, I have to tear myself away from the divine Prisoner. Yet, I never cease to live in him; all this takes place in the Heart of the Most Blessed Trinity, an immense distance from the earth; but Jesus wants me to enjoy him in his Eucharist and to grieve when I am far from his consecrated Host." "Her [Mary's] motherhood extends beyond view. In the will of the Son, she becomes at once mother and maid: sheltering him, but sheltered in him, forming him, but formed by him ... When she pronounces the words: 'Be it done to me according to thy word', the Mother conceives the mystery from the Trinity, in order to give it to the Son. The Son gives the word back to the Trinity by giving everything he has back to the Father in the Spirit. Then, after the Father has received it again, it is distributed to mankind by means of that extravagant expansioningthe Eucharist and the Holy Spirit." A divine peace flood me. For I have the Host as my support. To be nothing is my glory. "When we are before the Blessed Sacrament, instead of looking about us, let us shut our eyes and open our hearts; and the good God will open his. We will go to him, and he will come to us, the one to give, and the other to receive. It will be like a breath passing from one to the other. What delight we find in forgetting ourselves that we may seek God!" "This Sacrament really contains You, O my God, You whom the Angels adore, in whose presence the Spirits and mighty Powers tremble. Oh! if we could only see You clearly as they do, with what reverence would we approach this Sacrament, with what humility would we receive You." "To cast fire upon the earththat is my mission! And how I wish it were already blazing fiercely! Nothing in the world can set hearts ablaze with love for God like the Blessed Sacrament. That is why this divine bread has been pictured as a furnace of love. Saint Catherine of Siena saw far-reaching flames coming from this furnace of love and spreading throughout the world. Seeing this, Catherine simply could not understand how so many people could live without loving God. "My Lord, set me on fire with love for you. Let me think of nothing, crave for nothing, yearn for nothing, search for nothing, but you. How I wish to be caught up in this scorching fire of love! How I wish it would consume every obstacle that blocks my path toward you! Make my love for you grow stronger each day of my life." "This is a real presence which includes every dimension of who Jesus is: body and blood, human soul and divine person. The consecrated Eucharistic species are the Lord and therefore command our adoration. We do not adore ourselves, nor the ordained priest, nor the Bible, even though these are vehicles for Christ's spiritual presence; we do adore the Eucharist, this blessed sacrifice made really present sacramentally." "Dear Eucharistic soul: In that hour [of the Last Supper] Jesus thought of you. Have no doubt about it. He thought of you in particular, and had you before His eyes. He understood that, without that small, white, consecrated wafer, which you adore and which you receive every morning, you would feel lonely, very lonely, in your exile here below. He knew that your heart would hunger and thirst for love and be the prey of unmitigated nostalgia for heaven. He knew that on the road through life you would find many a cause for grief and, behind a smiling appearance, would have to conceal many a galling sorrow. And for your sake, dear soul, lest you be orphaned and without a loyal friend in whose understanding heart you might pour out the overflowing bitterness of your heart, Jesus overlooked all those sacrileges, profanations, and ingratitudes and, in that night, instituted the Eucharist for youunderstand this well!just for you. And for your sake He has remained in that small, white, consecrated Host which you receive each morning. Do you understand now, dear soul, how much you are loved by the Christ of the Cenacle and of the Eucharist?" "The essential commitment and, above all, the visible grace and source of supernatural strength for the Church as the People of God is to persevere and advance constantly in Eucharistic life and Eucharistic piety and to develop spiritually in the climate of the Eucharist." "Almighty and Eternal God, behold I come to the Sacrament of Your only-begotten Son, our Lord Jesus Christ. As one sick, I come to the Physician of life; unclean, to the Fountain of mercy; blind, to the Light of eternal splendor; poor and needy, to the Lord of heaven and earth. Therefore, I beg of You, through Your infinite mercy and generosity, heal my weakness, wash my uncleanness, give light to my blindness, enrich my poverty, and clothe my nakedness. May I thus receive the Bread of Angels, the King of Kings, the Lord of Lords, with such reverence and humility, contrition and devotion, purity and faith, purpose and intention, as shall aid my soul's salvation..."
"For He is in the midst of us day and night [in the Blessed Sacrament]; He dwells in us with the fullness of grace and truth. He raises the level of morals, fosters virtue, comforts the sorrowful, strengthens the weak and stirs up all those who draw near to Him to imitate Him, so that they may learn from his example to be meek and humble of heart, and to seek not their own interests but those of God." "You also realize, Venerable Brothers, that the Eucharist is reserved in churches or oratories to serve as the spiritual center of a religious community or a parish community, indeed of the whole Church and the whole of mankind, since it contains, beneath the veil of the species, Christ the invisible Head of the Church, the Redeemer of the world, the center of all hearts, 'by whom all things are and by whom we exist'." "Give me the grace to long for Your holy sacraments, and especially to rejoice in the presence of Your body, sweet Savior Christ, in the holy sacrament of the altar." "How is it that we do not die of love in seeing that God Himself could do no more than shed His divine blood for us drop by drop? When as man He was preparing for death, He made Himself our food in order to give us life. God becomes food, bread for his creatures. Is this not enough to make us die of love?" O Christ Jesus! true God and man, of one substance, majesty and power with the Father, with firm faith I believe and confess that You are truly and really present in this sacrament. For You who are the Truth itself, have said, "This is my body." I love You, O Christ Jesus, because You, in Your exceeding love for me, have come in the flesh, and have loved me even to death; and in the Blessed Sacrament have given me Yourself for a pledge of this love. I love You more than myself and than all things; at least, I most earnestly desire so to love You, and always to adhere to You alone. Oh, that by the force of this sacrament there may be cemented between You and me a union of love so great, that nothing may be able to separate me from the love of Christ my Savior. "Jesus, my God, I adore You, here present in the Blessed Sacrament of the altar, where You wait day and night to be our comfort while we await Your unveiled presence in heaven. Jesus, my God, I adore You in all places where the Blessed Sacrament is reserved and where sins are committed against this Sacrament of Love. Jesus, my God, I adore You for all time, past, present and future, for every soul that ever was, is or shall be created. Jesus, my God, who for us has endured hunger and cold, labor and fatigue, I adore You. Jesus, my God, who for my sake has deigned to subject Yourself to the humiliation of temptation, to the perfidy and defection of friends, to the scorn of Your enemies, I adore You. Jesus, my God, who for us has endured the buffeting of Your passion, the scourging, the crowning with thorns, the heavy weight of the cross, I adore You. Jesus, my God, who, for my salvation and that of all mankind, was cruelly nailed to the cross and hung there for three long hours in bitter agony, I adore You. Jesus, my God, who for love of us did institute this Blessed Sacrament and offer Yourself daily for the sins of men, I adore You. Jesus, my God, who in Holy Communion became the food of my soul, I adore You. "Jesus, for You I live. Jesus, for You I die. Jesus, I am Yours in life and death." And, for me, You surpass the delights of Heaven." "Like so many pilgrims before us, we kneel in wonder and adoration before the ineffable mystery which. was accomplished here... In This Child  the Son who is given to us  we find rest for our souls and the true bread that never fails  the Eucharistic Bread foreshadowed even in the name of this town: Bethlehem, the house of bread. God lies hidden in the Child; divinity lies hidden in the Bread of Life,"
"What does it matter where we go? Wherever we go, won't we be serving God there? And wherever we go, won't we have Our Lord in the Blessed Sacrament with us? Isn't that enough to make us happy?" "The veil of mystery has been torn asunder. He is there, my God, infinite Unity, adorable Trinity, under the appearance of a small piece of bread. Jesus is there, in His sacred Humanity, His Heart, His precious Blood, His Soul, His eternal Divinity; He is there, whole and entire, in each Host consecrated throughout the world and in each fragment of consecrated Host." "Good friends find pleasure in one another's company. Let us know pleasure in the company of our best Friend, a Friend who can do everything for us, a friend who loves us beyond measure. Here in the Blessed Sacrament we can talk to him straight from the heart. We can open our souls to him, tell him what we need, beg him for powerful graces. We are perfectly free to approach the King of the universe with full confidence and without fear." "When you have anything to suffer, rejoice and unite it to that which the Sacred Heart has suffered and still suffers in the Blessed Sacrament." "Let us love Him, then, this only Love of our souls, since He has first loved us and still loves us with burning ardor in the Blessed Sacrament. We have only to love this All-Holy One, to become holy: who can prevent us from being so, since we have a heart to love and a body to suffer?" "Communion is as necessary for us to sustain our Christian vitality, as the vision of God is necessary to the angels, to maintain their life of glory." "In the Mass and in Eucharistic Adoration we meet the merciful love of God that passes through the Heart of Jesus Christ." "This practice of adoration is based on strong and solid reasons. For the Eucharist is at once a sacrifice and a sacrament; but it differs from the other sacraments in this that it not only produces grace, but contains IN A PERMANENT MANNER, the AUTHOR of grace Himself. When therefore the Church bids us adore Christ hidden behind the Eucharistic veils and pray to Him for spiritual and temporal favors, of which we ever stand in need, she manifests living faith in her divine Spouse who is present beneath these veils; she professes her gratitude to Him and she enjoys the intimacy of His friendship." - The Blessed Sacrament, Abbot Columba Marmion, O.S.B. - The Blessed Sacrament, Abbot Columba Marmion, O. S. B. "The Church has a special duty to safeguard and strengthen the sacredness of the Eucharist. 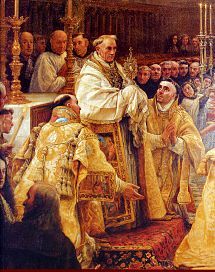 In our pluralistic and often deliberately secularized society, the living faith of the Christian community  a faith always aware of its rights vis-a-vis those who do not share the faith  ensures respect for this sacredness,"
"We do not sin when we adore Christ in the Eucharist; we do sin when we do not adore Christ in the Eucharist." "Do you realize that Jesus is there in the tabernacles expressly for you, for you alone? He burns with desire to come into your heart." "O Jesus, here present in the Holy Eucharist, Thy Heart is all aglow with love for me! Thou dost call me, Thou dost urge me to come to Thee ..."
"In obedience to humanity, the King of the universe come down from heaven! In obedience to humanity, he lives imprisoned on the altar! I shall not resist. He allows humans to keep him wherever they wishin monstrance or tabernacle; to carry him in procession; to bring him into the homes of the sick and dying; to dispense him to all, whether saint or sinner. The gospel tells how marvelously he obeyed Mary and Joseph. Today he obeys every priest in the world." "My heart feels as if it were being drawn by a superior force each morning just before uniting with Him in the Blessed Sacrament. I have such a thirst and hunger before receiving Him that it's a wonder I don't die of anxiety. I was hardly able to reach the Divine Prisoner in order to celebrate Mass. When Mass ended I remained with Jesus to render Him thanks. My thirst and hunger do not diminish after I have received Him in the Blessed Sacrament, but rather, increase steadily. Oh, how sweet was the conversation I held with Paradise this morning. The Heart of Jesus and my own, if you will pardon my expression, fused. They were no longer two hearts beating but only one. My heart disappeared as if it were a drop in the ocean." "How many there are who still say, 'I want to see His shape, His image, His clothing, His sandals.' Behold, you do see Him, you touch Him, you eat Him! You want to see His clothing. He gives Himself to you, not just to be seen but to be touched, to be eaten, to be received within .... Let all of you be ardent, fervent, enthusiastic. If the Jews stood, shoes on, staff in hand, and eating in haste, how much more vigilant should you be. They were about to go to Palestine; ... you are about to go to heaven." "Any time spent before the Eucharistic presence, be it long or short, is the best-spent time of our lives." "Father of mercy and God of all consolation, graciously look upon me and impart to me the blessing which flows from this holy Sacrament. Overshadow me with Your loving kindness, and let this divine Mystery bear fruit in me."